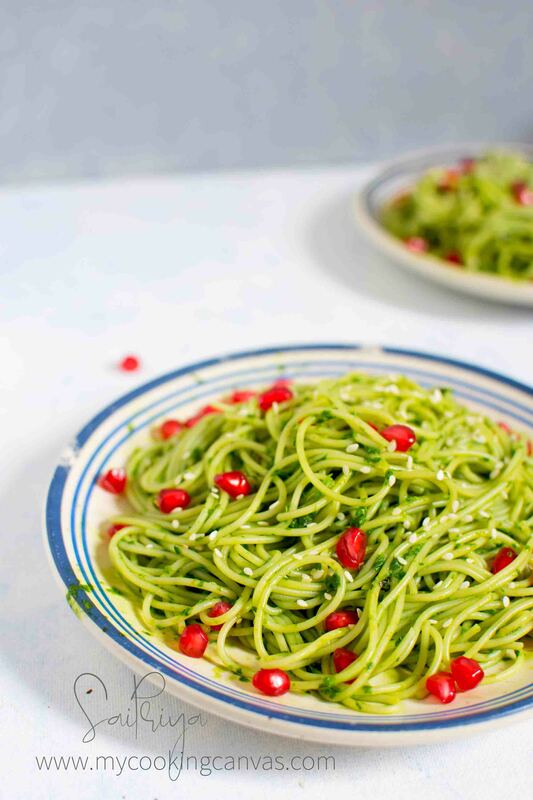 Make this Vegan Spinach Pasta Recipe in just 15 minutes. 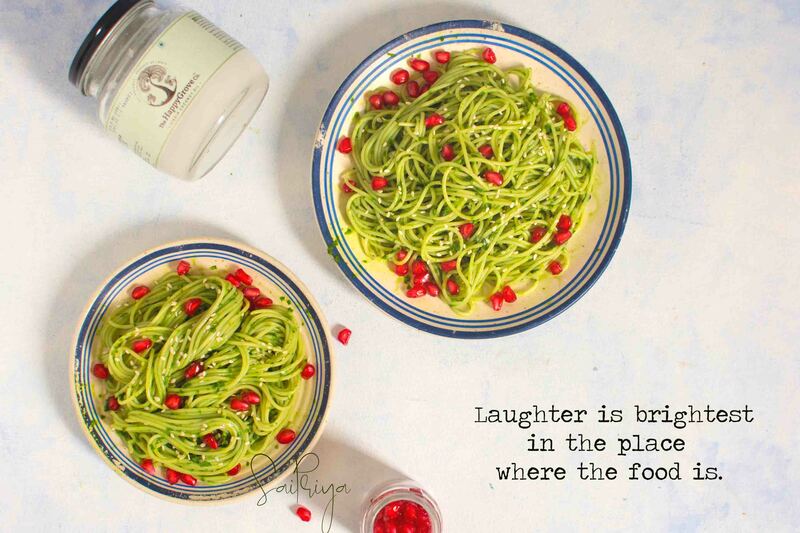 It is super healthy and comes with the goodness of virgin coconut oil. This is such a comfort food that you will love to make again and again. That green color is what will tempt others to try. Even kids will love o try. I have added a handful of fresh pomegranate seeds to make it more tempting. Though you can skip adding that. The recipe is quite easy. It is a rich source of beta-carotene, lutein, and xanthene, all of which are beneficial for eyesight. spinach is rich in Vitamin K.It helps in blood clotting by producing prothrombin that treats hemophilia. I have used baby leaf spinach here for the dish. As I have used it as Raw in making the sauce. And you will get a nice green color when you mix with creamy coconut milk. I am sure you must have assumed it to be Zucchini Pasta at the first sight. It looks so similar. I have used Virgin Coconut oil from The Happy Grove They procure the best coconuts in India from plantations , and follow the British Retail Consortium (BRC) standards for hygiene practices. They are particular about producing only the highest quality, cold processed virgin coconut oil. What Is So Special About their Coconut Oil? In other words, the most natural, pure virgin coconut oil. 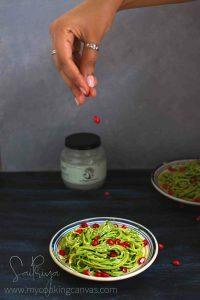 Let’s make Vegan Spinach Pasta..you can pair a hot coffee or a glass of wine with it. I have added roasted sesame seeds which are optional. It can be replaced with sunflower seeds or pine nuts. In a pan add virgin coconut oil and saute minced garlic. Add cayenne pepper and fry for 1 minute at medium flame. Add grounded ginger and fry. Reduce the flame and slowly add coconut milk and crushed black pepper.Cook for 30 seconds. Cool this mixture. Add baby spinach and make a fine paste of it. Your sauce is ready. Boil 3 cup water. Cook Semolina Angel Hair Pasta for 3 minutes or as per instruction on the packet. Put salt while boiling. Drain the water and mix this to the sauce. Add roasted sesame seeds and serve immediately. Garnish with fresh pomegranate seeds.